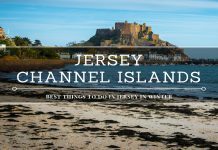 Jersey may not be the first place you think about when picking the best places around the UK for an eclectic food scene but we would argue that the capital of St. Helier should certainly be on your radar. 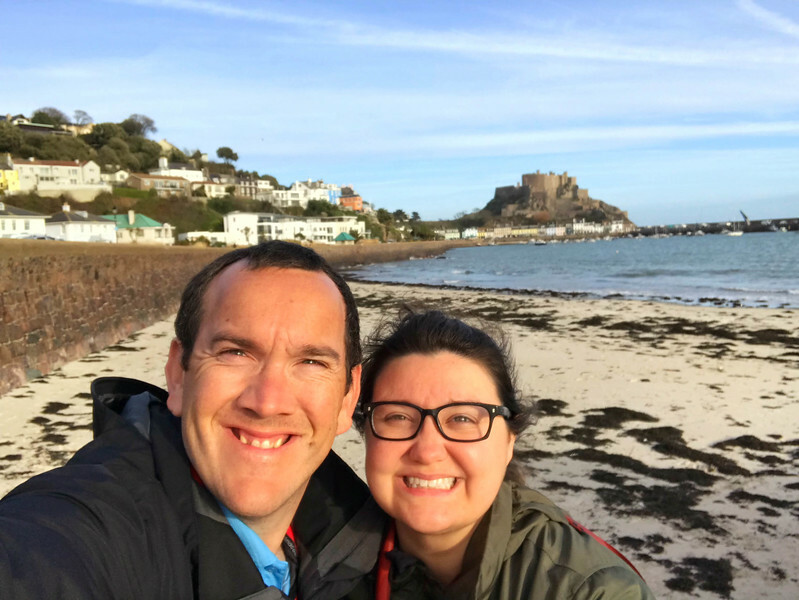 After spending three days on the Channel Islands’ largest island, we quickly became accustomed with the best restaurants in St. Helier. 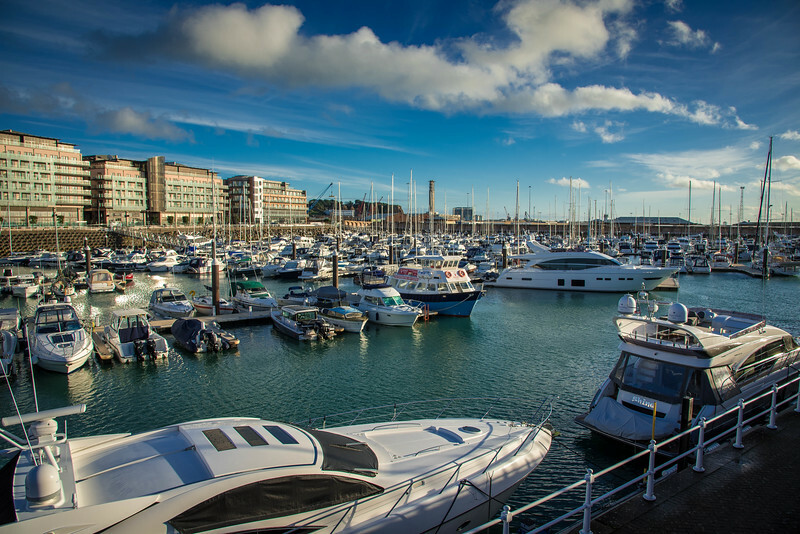 Although Jersey is home to some excellent restaurants in other parts of the island, we want to focus our attention on why St. Helier’s “foodie scene” is such an attraction for visitors heading to this island. Whether you are looking for the best coffee shop to enjoy a light snack and espresso while mingling with friends or perhaps you want a fine, luxury dining experience to end your day in the romantic ambiance created by gorgeous decor, St. Helier is home to a myriad of different options that will satisfy your preference. 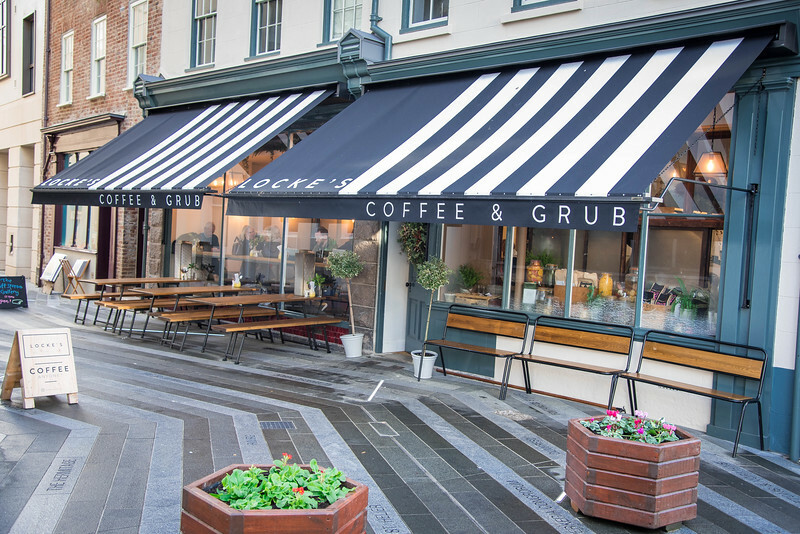 Let’s take a look at 10 of the best restaurants/cafes/coffee shops in St. Helier and perhaps you will be inspired to book a weekend getaway to the island of Jersey to check these out for yourself. It doesn’t matter what time of the year you are visiting Jersey, as you can be sure all of the following restaurants will be open and raring to entice you through their doors…it certainly worked with us! 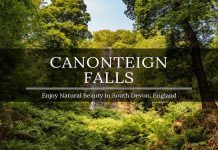 After a long day exploring the very best things to do in Jersey, there is nothing quite like finding a luxury restaurant to spoil yourselves with a little fine dining. 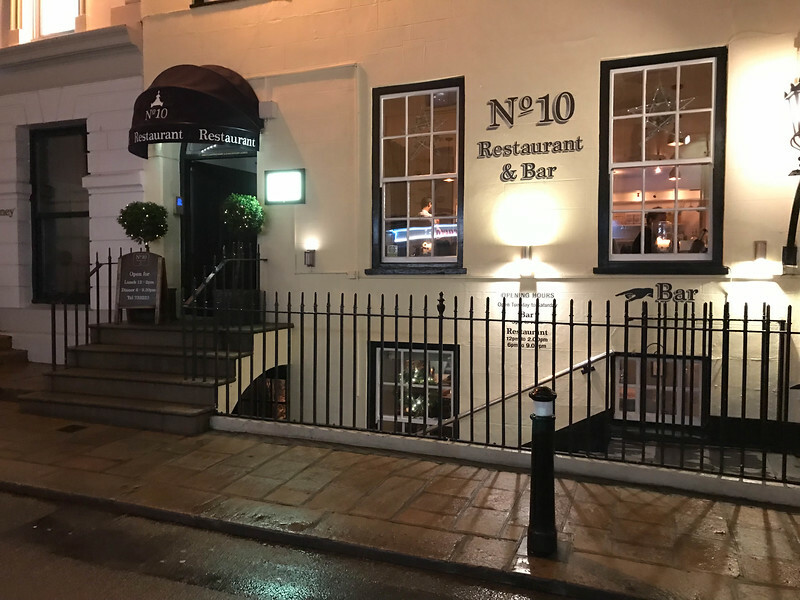 We think we have found the perfect place to experience the above in the heart of St. Helier at Number 10 Restaurant and Bar. For those of you that love to experiment in the kitchen or simply enjoy sampling the “modern era” of cuisine, the eclectic menu offerings at Number 10 Restaurant and Bar will perfectly fit your style. The restaurant showcases seasonal cooking that represents the very best of British and European cuisine. From fresh ingredients to the fine details of the aesthetic appearance of the served dishes, Number 10 Restaurant and Bar offers a casual, relaxed space for locals and visitors alike to enjoy a delicious luxury meal while knowing every detail is addressed. The beauty of visiting this restaurant is not only because of the quaint, secluded setting that immediately makes you feel like you will be catered for (as opposed to the larger, chain style restaurants) but also because the top-notch customer service by everyone at the restaurant. You are their guest for the evening and you leave knowing that you have been treated like royalty! Visiting Number 10 Restaurant and Bar at Christmas meant we had the option at selecting one of the festive delicacies. I couldn’t resist the lamb ribs served with sherry caramel and mojo verde to start while Heather opted for the oxtail tortellini. For our main course, the seafood option was irresistible, as was the filet mignon. 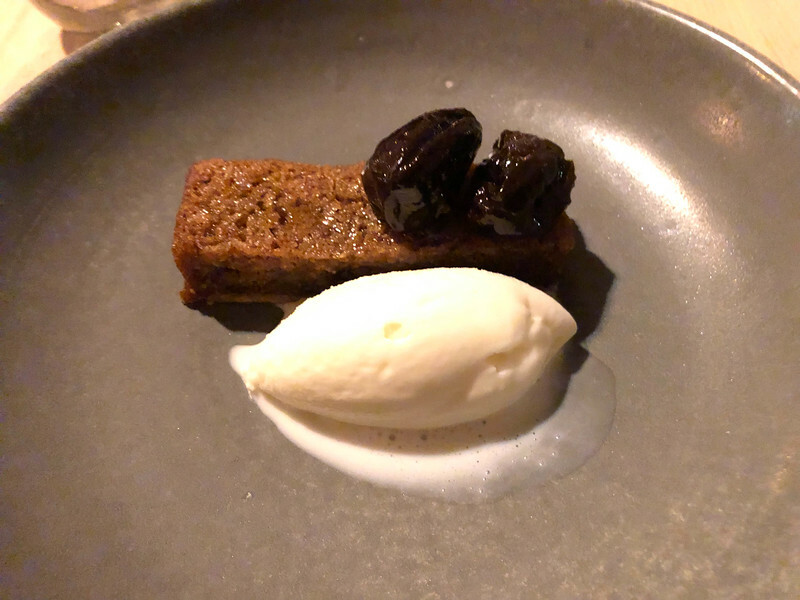 By the time dessert arrives, it’s a tough choice to make because not only have you enjoyed two amazing courses but there is a pretty wide selection to choose from…just see where you sweet tooth takes you! If you are looking to visit a luxury restaurant that has received a myriad of accolades, look no further than Bohemia. 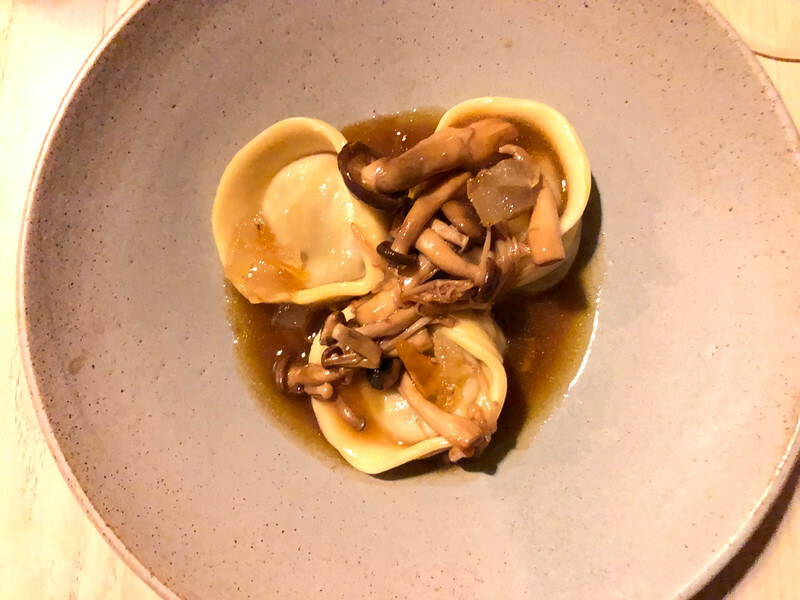 Ranked as the 11th Best Restaurant in the UK by The Good Food Guide in 2018, this alone shows that Bohemia is a restaurant that everyone should consider visiting when on the island of Jersey. With so many restaurants around the UK, it’s no mean feat to achieve this recognition as being one of the very best restaurants. This restaurant is renowned as having style in abundance with chic decor and of course, a vibrant energy throughout that welcomes visitors from all corners of the globe. 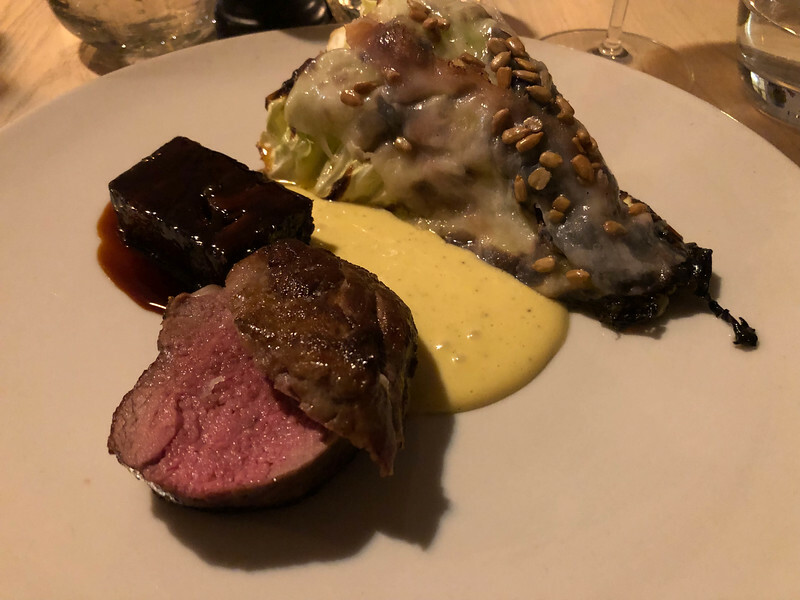 Steve Smith, the executive chef at Bohemia, is a world recognized chef and it’s no surprise that this restaurant is reaping the rewards of his masterpieces available on the menu. One of the reasons why Bohemia is so popular is the constant evolution of the menu throughout the various seasons. This always intrigues visitors to return and sample Steve Smith’s delicious offerings. In addition, all of Smith’s dishes feature a large amount of local ingredients and highlight seasonal vegetables. In terms of historic restaurants on the island of Jersey, La Capannina is perhaps at the very top of the list given it’s long standing tradition of being one of the most popular around the island. Not only is this one of the islands’ longest standing restaurants, but it also possesses a reputation of having high-quality cuisine and certainly knows how to stand the test of time through excellent service and a perfect location in the heart of St. Helier. Head chef Mauro and his team of dedicated staff, offers a distinctive blend of fine Italian and French dining options. For those of you looking to unwind and relax in a warm atmosphere, while indulging in menu items finely crafted to the highest quality, La Capannina is definitely a place you won’t want to miss out on. Did you know that Restaurant 1840 at The Savoy was named after the year the original restaurant was constructed? This “in-house” restaurant inside The Savoy hotel allows guests and visitors the opportunity to experience Jersey produce at the highest level. The finest, local ingredients can be found in almost every dish served here, whether it’s the Jersey Royal potatoes or the local catch of the day from the sea. A Sunday lunch is a popular time to visit Restaurant 1840 because of the renowned offerings but the reality is, this is a dining establishment that you can visit during any of the opening hours and have an amazing experience. Whether you choose to stay at The Savoy or simply visit to sample the delicious cuisine at Restaurant 1840, this is a place that is well recognized across the island, not only because of the rich history but because the allow their food and service to do the talking! 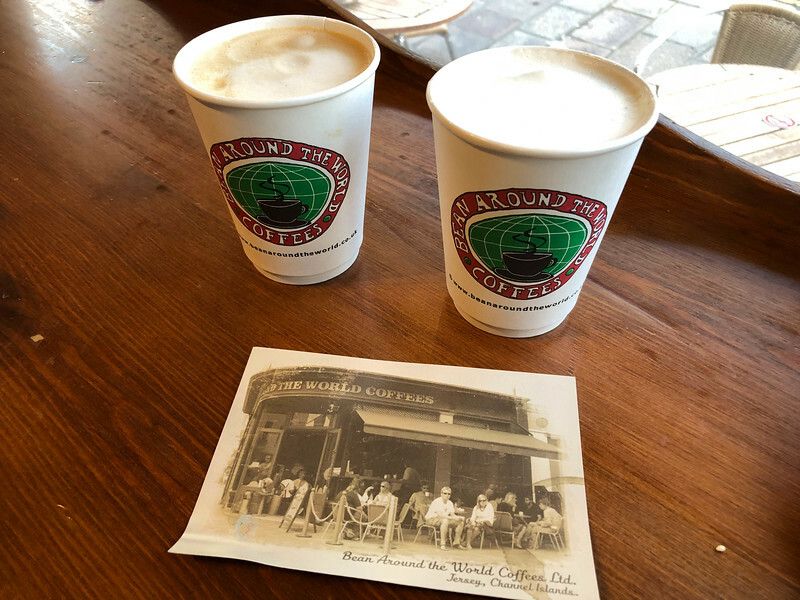 If you have been following our travels around the world, you will know that we love stumbling across local coffee shops when we visit new destinations. I’m going to be completely honest, I had no idea that the island of Jersey was going to offer such a dynamic and widespread coffee scene. 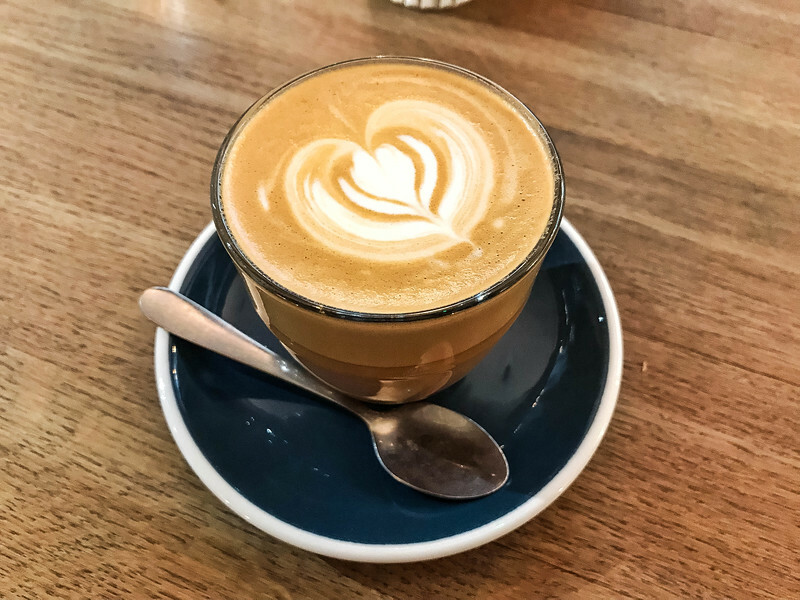 Not only were we pleasantly surprised but we also fell in love with a number of the coffee shops and they quickly rose to the very top of our favorite coffee bars around the world. 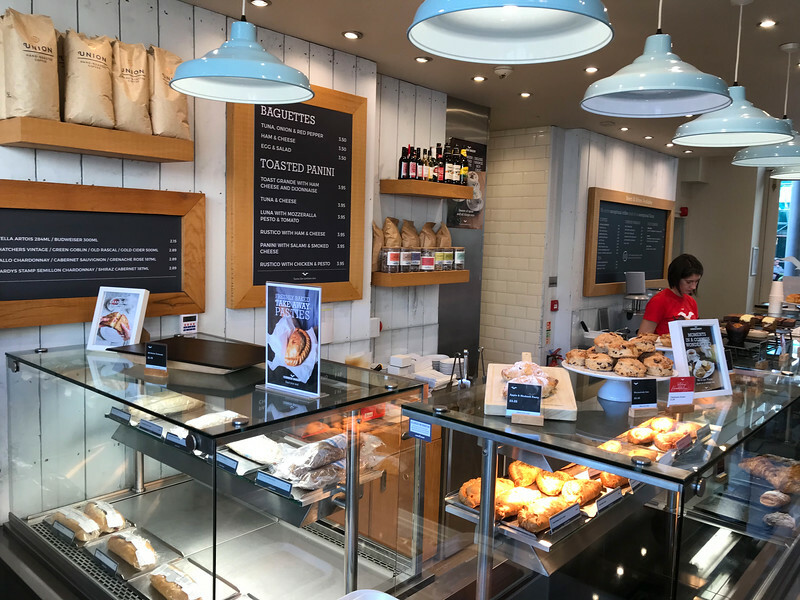 The beauty of many of St. Helier’s coffee shops is that they could easily fit into another category in this post because they offer much more than just your traditional “coffee shop” menu items. Of course, you can pick your favorite espresso or cake but many of these also have a widespread menu for breakfast, lunch or even dinner options. It’s crazy to think that you can walk into a coffee shop and immediately fall in love with the place, even before you have sampled the drinks and food available. This was definitely the case with Locke’s Coffee and Grub in the heart of St. Helier. The history of Locke’s is enough to justify falling in love with it, given that it was a former music store and it was the focus of a campaign by the National Trust to preserve and protect it from development. 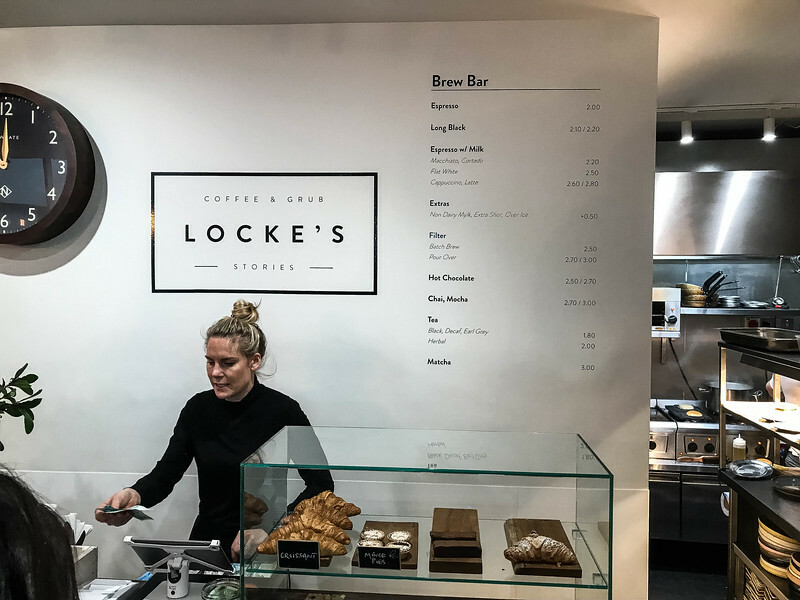 Locke’s Coffee & Grub, owned by the husband and wife team of Drew and Ella, has been developed into the gorgeous coffee shop that we see today, yet still maintaining much of the traditional feel of that original shop. 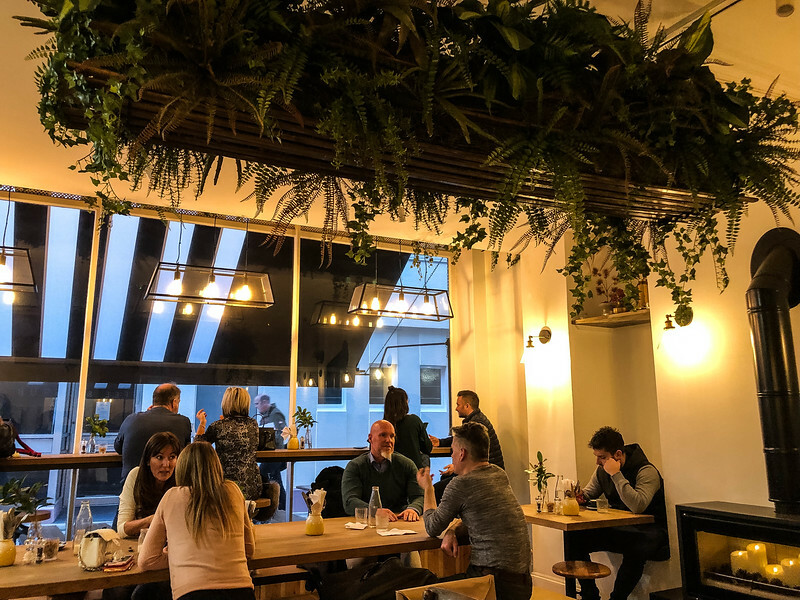 The contemporary feel throughout the interior of this coffee shop, with urban farmhouse style benches and a gorgeous fireplace to keep guests warm during the cold winter months, is one that makes this a popular spot among locals and visitors alike. But the real treat is when you start sampling the delicious espresso drinks or hot teas. A simple latte is concocted to perfection, while those that prefer tea will be able to filter their own brew to perfection. Did I also mention that Locke’s offers a variety of food options? 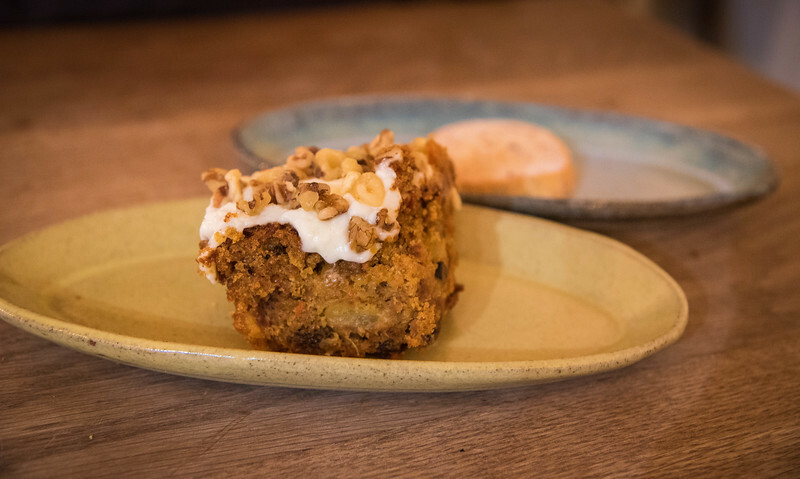 That’s right, for those of you wanting to grab lunch, there is an eclectic menu of artisanal options while if you just want something to accompany your coffee, opt for the decadent carrot cake or selection of mouthwatering cookies. 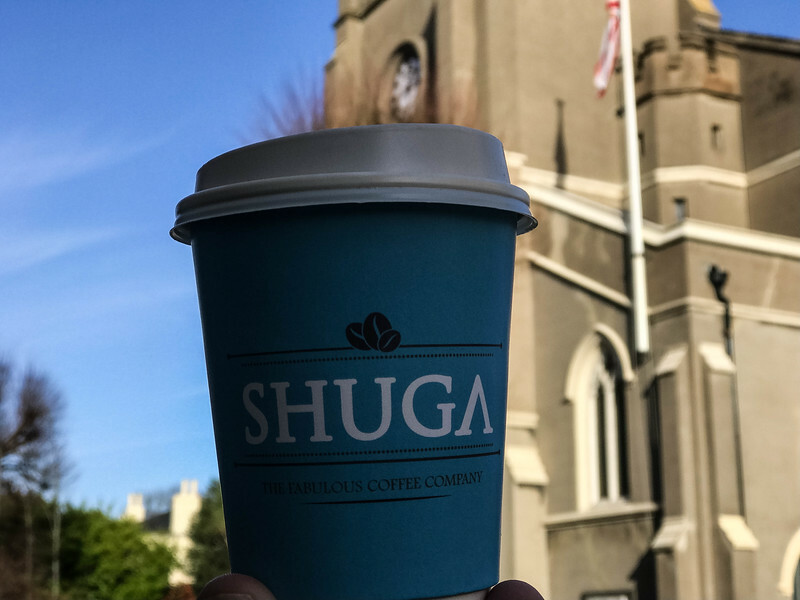 For those of you that love the modern era of coffee…you know, the lighter, sweeter flavors rather than the bold, traditionalist style coffees, the best place to visit in St. Helier is Shuga. The modern brewing techniques used here help create the amazing, diverse collection of coffee options and I have to admit, they have a unique taste that is definitely one that you will remember. 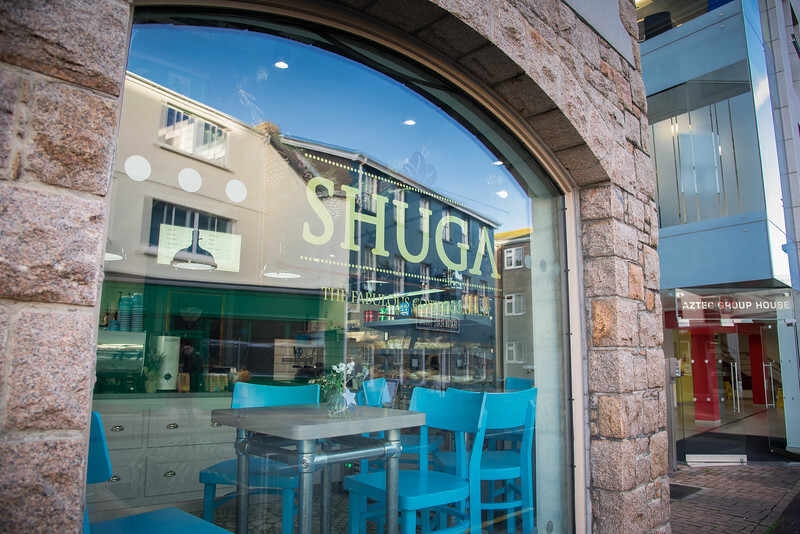 Located in Seaton Place in the heart of St. Helier, Shuga is a small coffee shop but despite its size, don’t let this fool you in terms of the quality of coffee available. 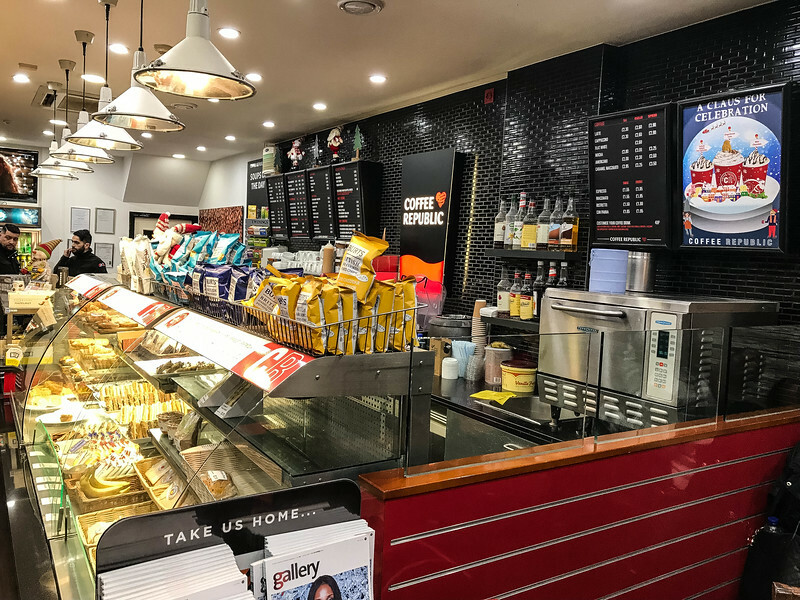 All of the standard beverages are available for purchase along with a few local favorites and of course, a visit to Shuga wouldn’t be the same without sampling one of the delicious muffins or other pastries. The moment we walked into Shuga, we were made to feel at home. The local baristas immediately started conversation, wanting to get to know about our time in Jersey and of course, recommending that we return in the peak summer months. 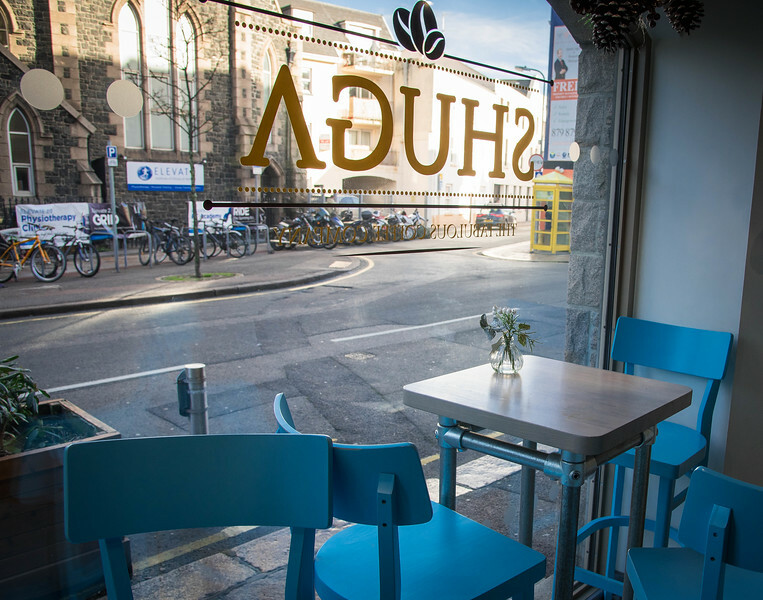 If you love coffee you’ll love Shuga! 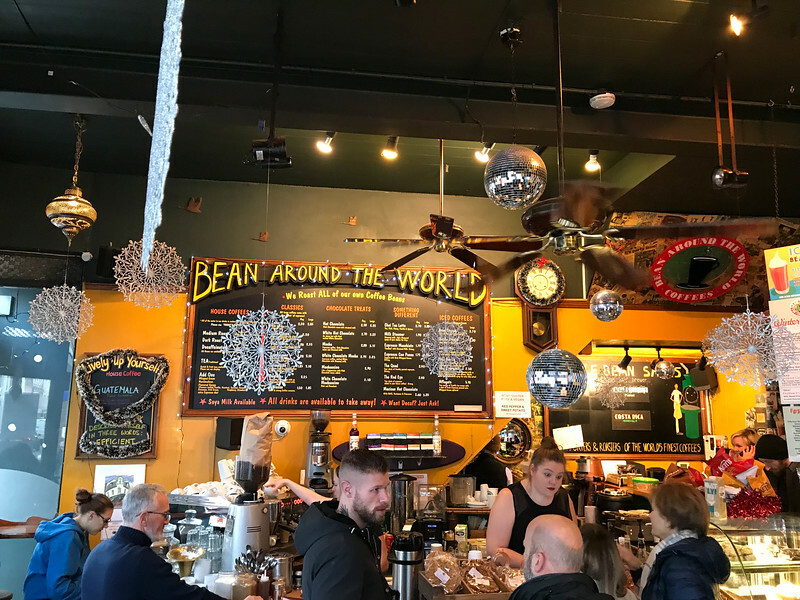 When it comes to trendy, vibrant coffee shops, there are not many that can compete with the wonderfully named Bean Around The World, located in the heart of St. Helier. 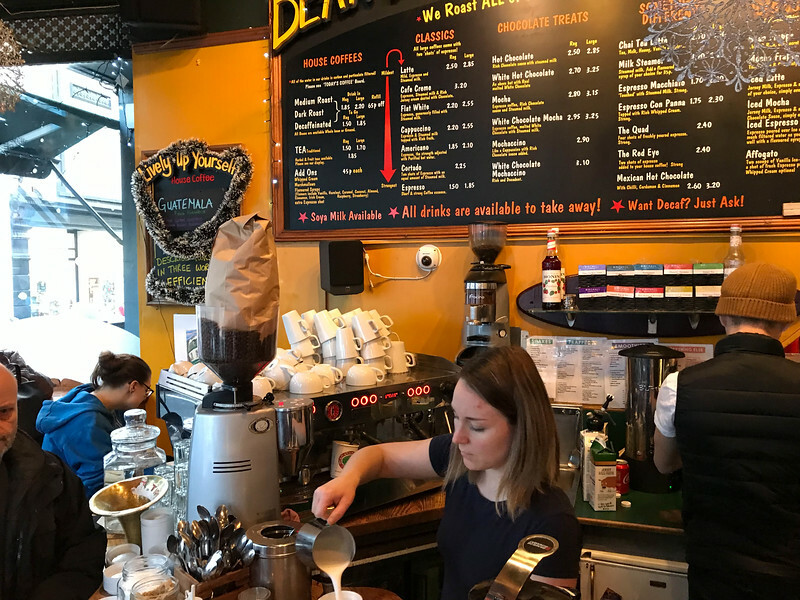 This bustling coffee shop is a popular choice among locals and visitors alike, not only because of the vibrant atmosphere throughout this coffee shop but also because of the quality beverages and food available here. Folks, we can attest that this 100% unlike any other coffee shop we have visited across the globe. Take a moment to think about a place that is home to a diversity of cultures from around the world and well, I think this pretty well summarizes the vibe throughout Bean Around The World. The beauty of this coffee shop is that the menu is really diverse. 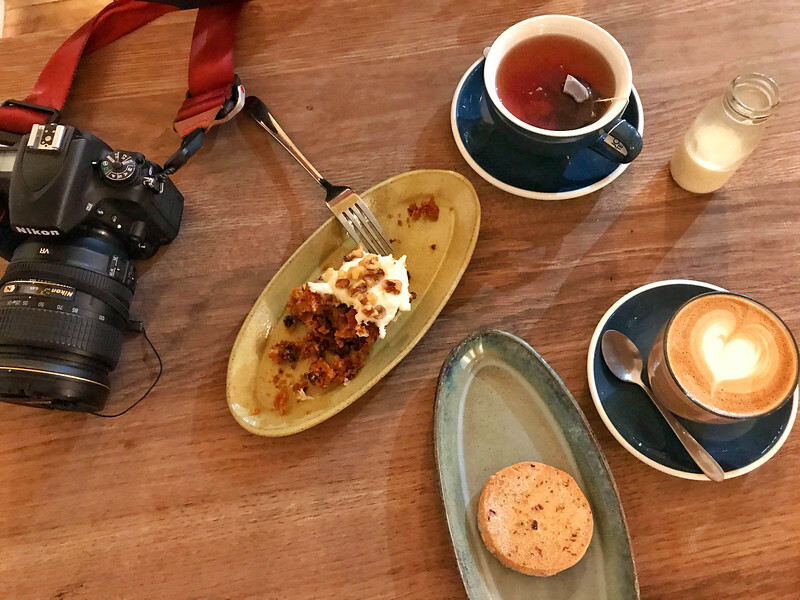 Whether you are opting for a simple coffee, a complex espresso concoction or perhaps you want to stay here for lunch and relax among the locals, the eclectic menu is one that will leave you spoiled for choice. 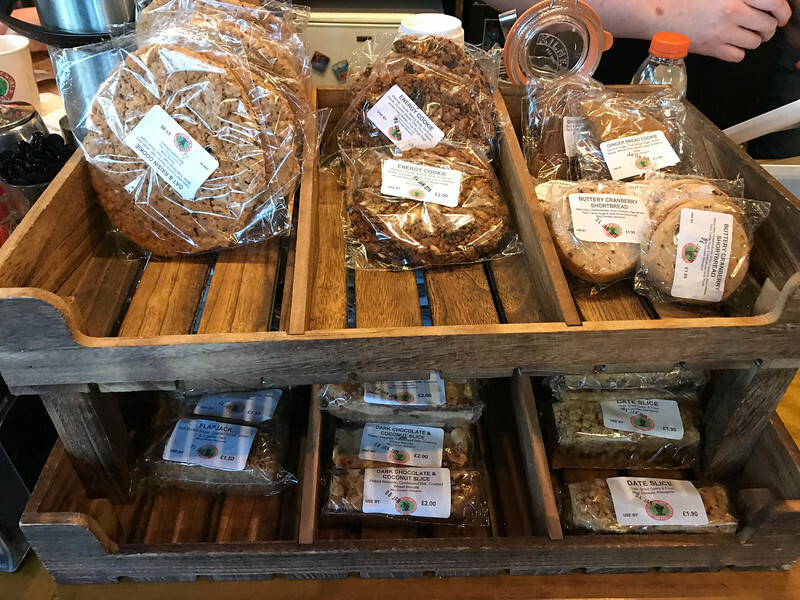 When you also find out that all the bakery items, paninis, salads and soups are homemade, well I think this pretty much sells this place as the perfect place to “hang out” at any time of the day. 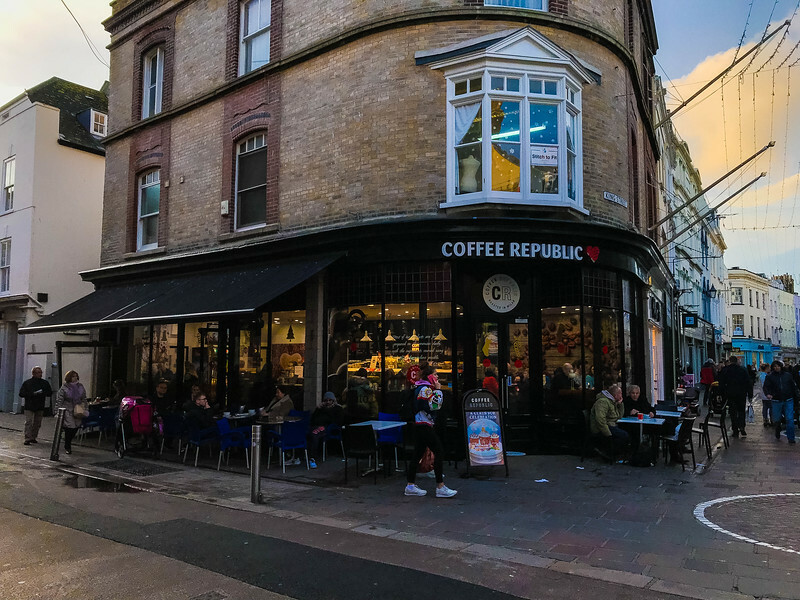 Although we don’t usually include chain restaurants or coffee shops in our reviews, when we stumbled across Coffee Republic along King Street in downtown St. Helier, we couldn’t resist visiting. 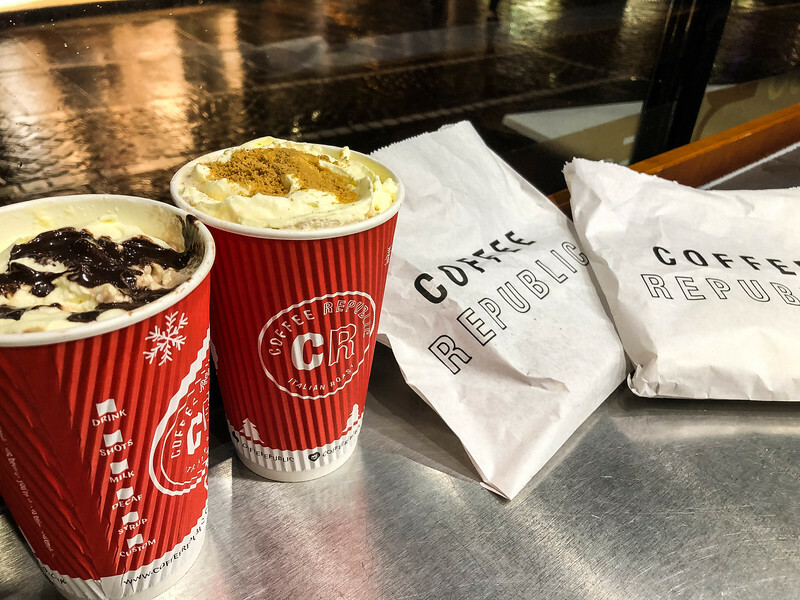 Whether it was because we visited Jersey just before Christmas and the appeal of the Coffee Republic seasonal drink selection was such that we couldn’t resist, I don’t know but we quickly fell in love with this place. 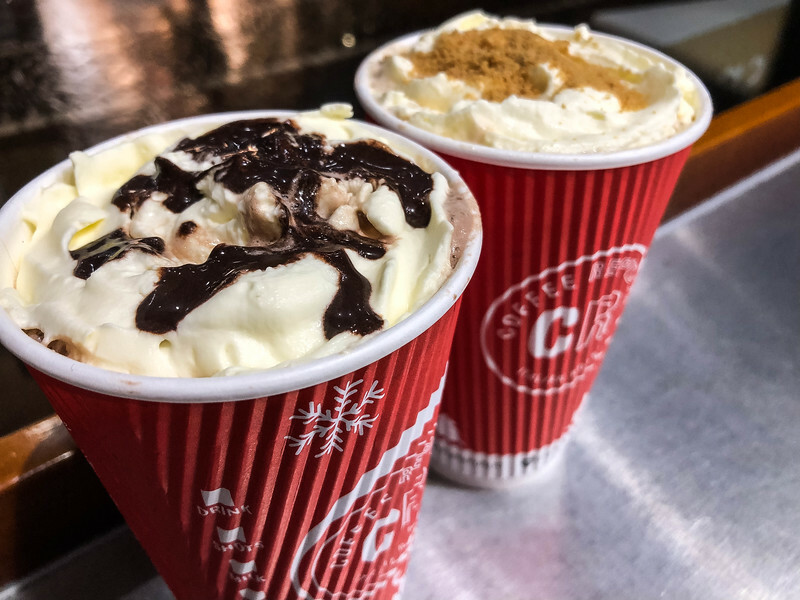 Heather opted for the Turkish Delight Hot Chocolate which was decadent, smooth and of course, the perfect drink on a cold winter’s day after a long hike along Jersey’s rugged north coastline. I opted for the Gingerbread latte and it certainly didn’t disappoint. One of the best reason to visit any chain coffee restaurant (yes, I openly admit we both love Starbucks and Costa Coffee around the world) is they are generally larger and you have more space to relax. 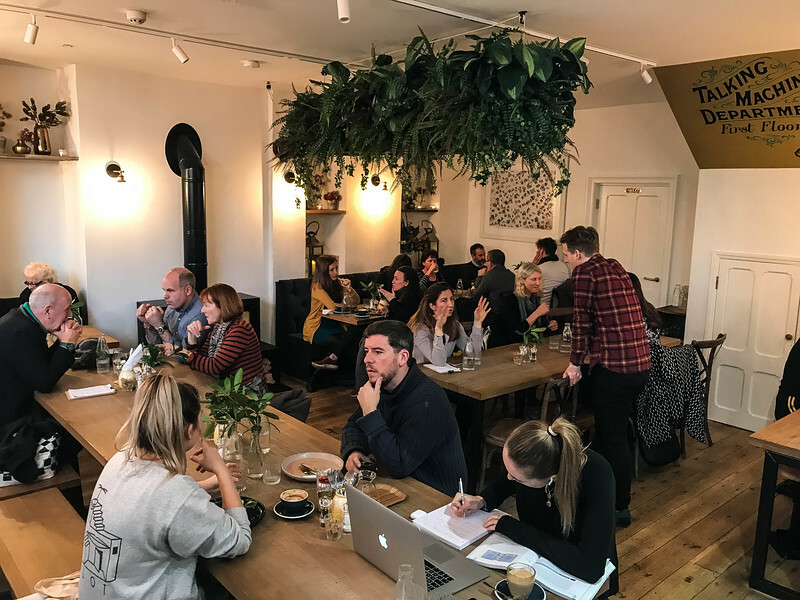 If you are looking for the intimate coffee shop environment, I think one of the aforementioned options in St. Helier would be more appropriate but if you want to catch up on some work or simply chat among friends, I think you may well fall in love with Coffee Republic as much as we did. 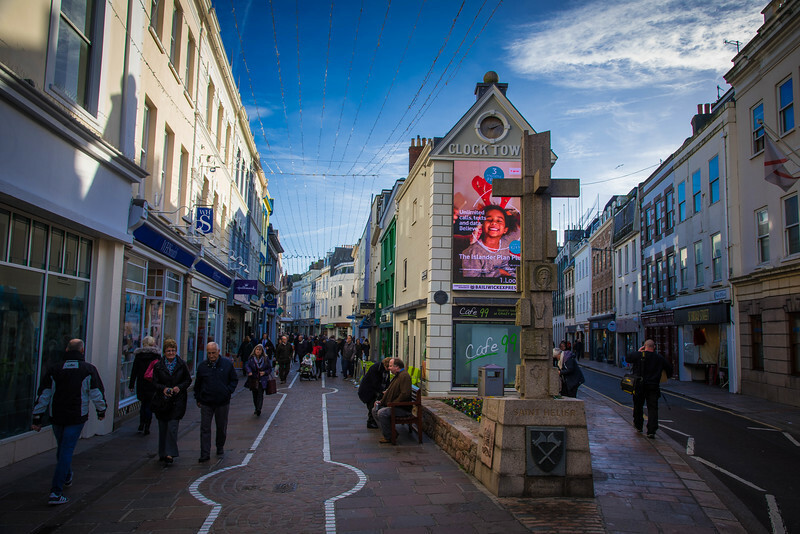 Dining in St. Helier isn’t just about the fine dining establishments because there are a myriad of other places where you can grab a light bite to eat. 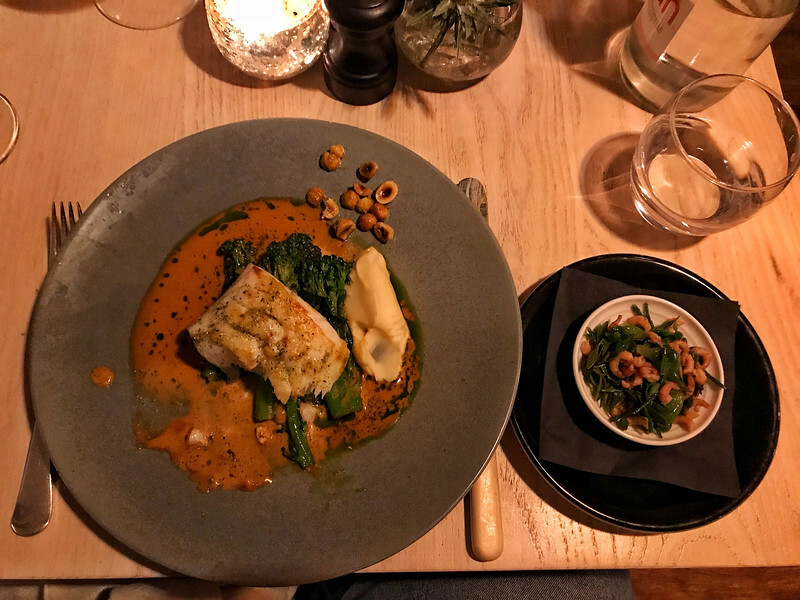 The reality is that the above restaurants can be a little expensive and perhaps should be saved for those occasions where you want to spoil yourselves. Don’t worry though, St. Helier is home to a number of options that are affordable and offer equally delicious food. Let’s take a look at four of our favorites. 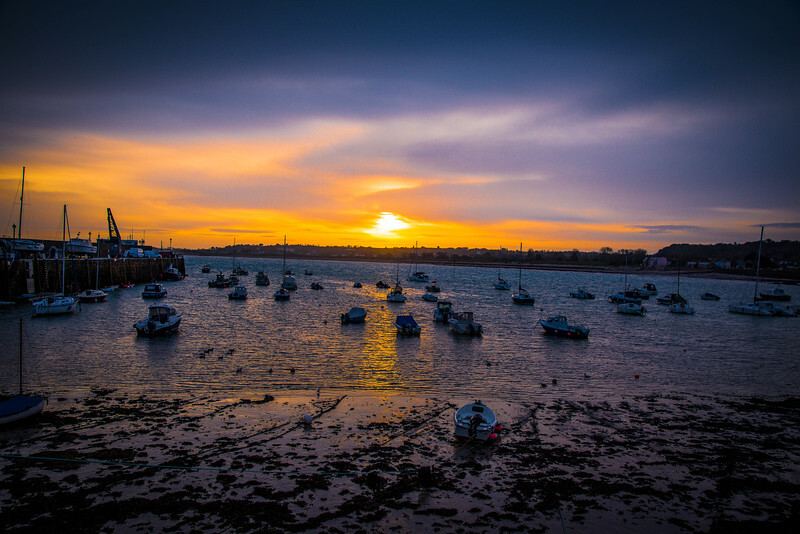 When you think about visiting the island of Jersey, you are unlikely to be thinking about enjoying a delicious Cornish pastie while exploring the town of St. Helier. 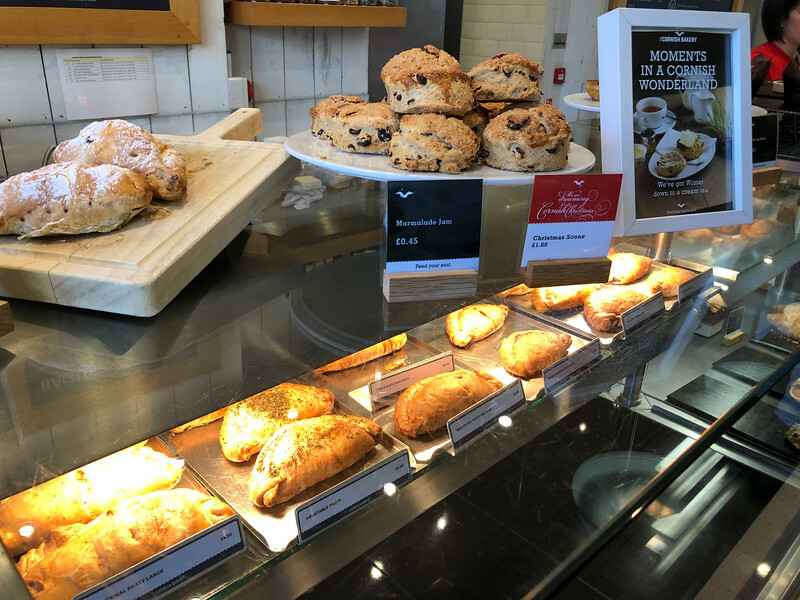 But thanks to The Cornish Bakery, you can enjoy one of these appetizing options without having to think about heading to the South-West corner of England. 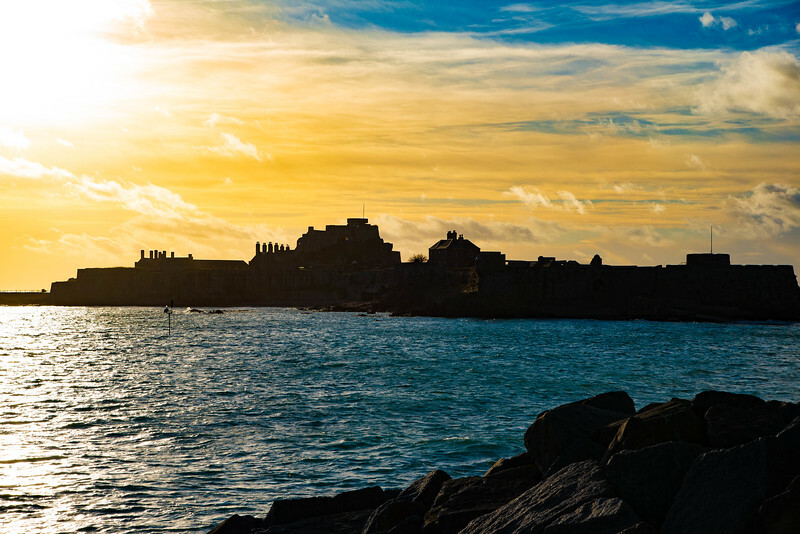 After exploring the Waterfront area of St. Helier by admiring the plethora of gorgeous yachts and peering out across the water to Elizabeth Castle, The Cornish Bakery is ideally situated in Liberty Wharf to enjoy a quick snack and drink before continuing your journey to discover the best attractions and landmarks around Jersey. 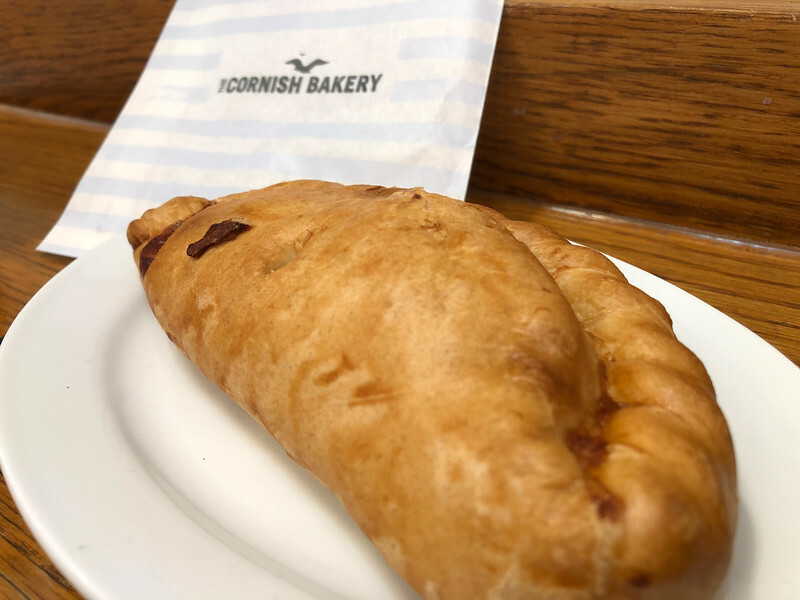 Recommendations on the best things to order at The Cornish Bakery? Well, you really can’t go wrong with a traditional “pastie” and I couldn’t resist it, while Heather opted for one of the paninis which was equally appetizing. A variety of coffee options and cold beverages are available and with views overlooking the Waterfront, this is a great spot to relax. 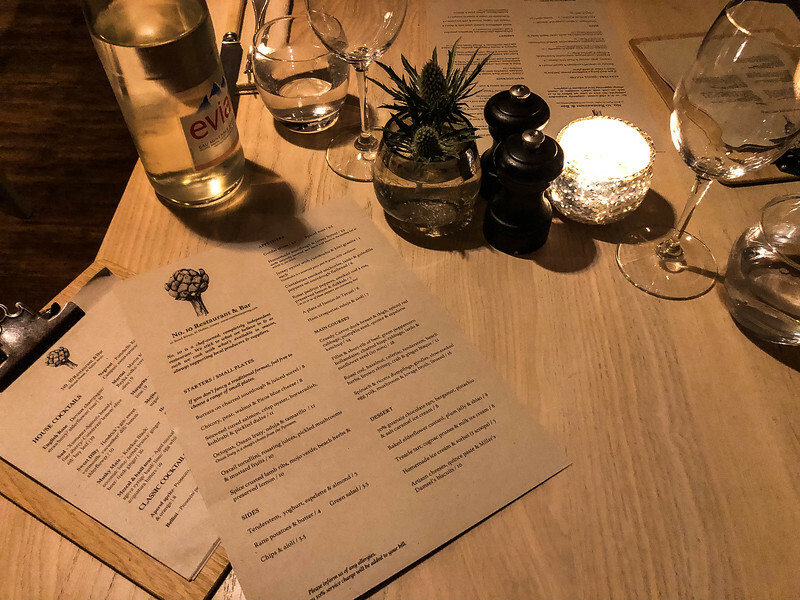 When you start exploring the best restaurants in St. Helier, be prepared to have an open mind because there are some quirky options out there. La Fregate Cafe for example epitomizes St. Helier’s “unorthodox” style given that it is a building that looks just like an upturned boat! As crazy as that may sound, this is a great spot to enjoy a “hearty homemade Jersey burger” or perhaps you are raring to sample pizza on the island. Head to La Fregate Cafe with an open mind and be prepared to enjoy the diverse menu selection – regardless of what you choose, you are going to love it! 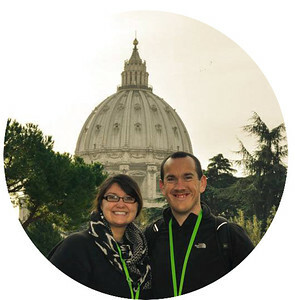 Deciding where the best places to eat are in any destination can be challenging, particularly when there are so many to choose from. 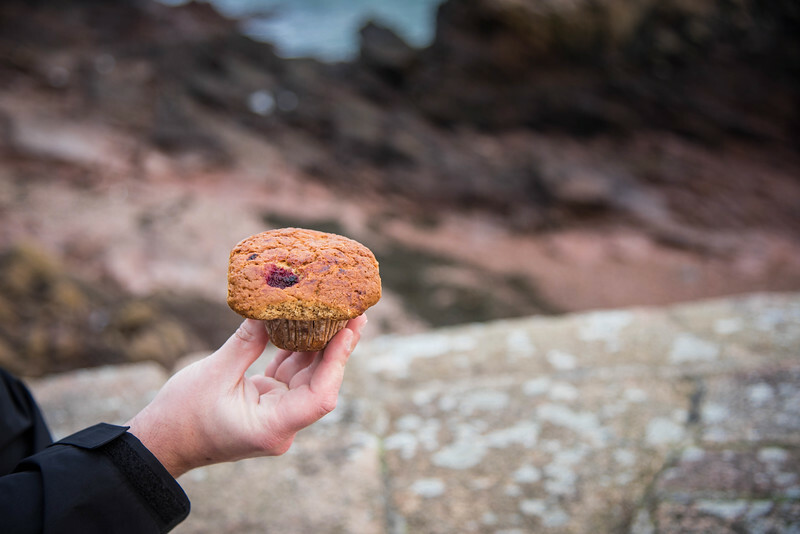 After spending three days exploring the beautiful island of Jersey, we quickly realized that the eclectic diversity of cuisine options available was going to make deciding where to pick incredibly difficult. We thoroughly enjoyed experiencing many of the aforementioned restaurants, coffee shops and cafes but we also know that there are many others out there that deserve to be mentioned. 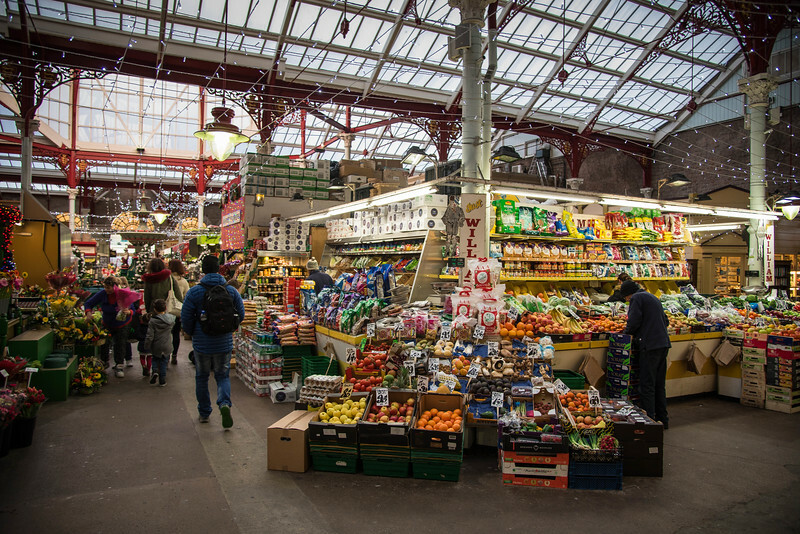 Alternatively, you could always head to the amazing St. Helier Central Market which has a variety of stalls inside where you grab a bite to eat or perhaps head back to your chosen accommodation and prepare something. 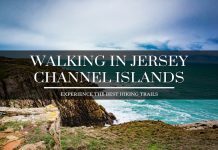 Hopefully, during our next trip to Jersey, we will have the opportunity to explore another selection of local restaurants and add more to this list of the best places to eat! Next articleGeneva to Zurich – How to Enjoy Epic Scenery in Switzerland?